The Windows Live Photo Gallery Facebook Plugin enables the direct upload of photos from Windows Live Photo Gallery to Facebook. Two applications are needed to make this work. Windows Live Photo Gallery [link] and the Facebook Plugin [link] have to be installed on the computer. There is no need for a Windows Live account but at least one Facebook account is obviously needed to upload the photos from the computer to Facebook. The plugin should be installed when Windows Live Photo Gallery is not running. 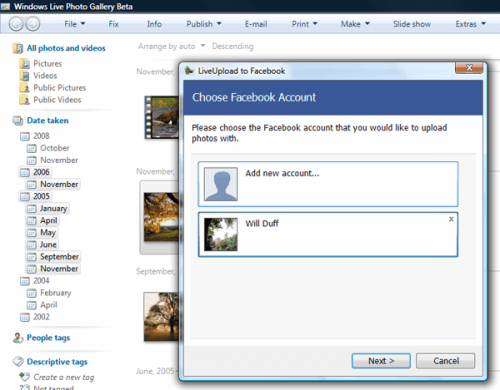 During first usage a Facebook account has to be linked to the Windows Live Photo Gallery application. This simply involves logging in to Facebook when the Windows Live application asks you to. A few other options will pop up during that process. An album has to be created if none is currently available. There is also the option to automatically accept images that get uploaded this way or to manually approve them instead. Manually approving the images would mean to accept them on the Facebook website after transferring them from Windows Live Photo Gallery to Facebook. Using the uploader is simple after creating the first account and album on Facebook. Images that should be uploaded are marked by the user who then selects Publish > LiveUpload To Facebook option from the main menu. Afterwards its simply a matter of selecting the account and the album to upload the images. It is always possible to link another account to the application or to create another album for an already existing account. I am new to Windows Live Photo Gallery to Facebook uploading. When I select a picture to put into a photo, it makes me create a new album title to put the photo into. Shouldn’t a dropdown of my current albums just show up so I can pick one of the current ones in my Facebook Albums? Am I doing something wrong? Any help is appreciated. Thank you.